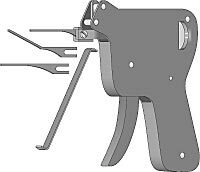 The Pick Gun was designed for law enforcement agencies to quickly pick pin tumbler locks. Unlike conventional hand picks that activate only one or two cylinder pins at a time, this tool is designed to span all the pins at once. The needle, powered by trigger action, strikes all the cylinder bottom pins simultaneously. As the force is transferred to the upper pins, they momentarily rise in the chambers and create a wide gapping shear line. At precisely that moment, with pressure applied on the tension wrench, the plug turns to the opening position! Various amounts of pin striking action is achieved by merely adjusting the knob. Comes complete with 3 steel needles and tension wrench. NOTE: This is a restricted sale item; you must agree to the Terms of Agreement for Ordering Locksmithing Equipment before ordering.